Kasem Island Resort is located on a beautiful island on the Mae Klong river close to Kanchanaburi city. The Resort offers clean rooms for overnight visitors, restaurant serving various meals, a meeting room (up to 50 people) for the businesses, lovely swimming pool, and Thai traditional style lobby room, all on the garden island. They also provide rafting tours, and eco-tours to the national parks and villages in Kanchanaburi province, as well as visit to elephant camps. Aircon rooms are fitted with private bath room and hot/cold shower. Fan rooms on the rafts are constructed of bamboo, wood and thated roof, including private bathroom without hot water. 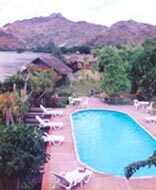 All rooms have balcony and windows overlooking the beautiful river and mountains beyond. Things to do from this resort: relax amids the beautiful surroundings of garden, river and the mountains, visit to the famous bridge over the river Kwai, other tourist spots, national parks, watrefalls, train ride, camping and climbing, rafting, boating, excursion to Thailand - Myanmar border at Sangkhlabury and Thong Pa Pun, boating on Meklong river, etc. Note: Check out time is noon. Ferry boat between the island and the main land (3 min ride) is free of charge for the guests between 0700 hrs and 2200 hrs. Car parking is available close to the resort office at Chukadon pier. 44-48 Chaichumphol Road, Tambon Ban Tai. Kanchanaburi. Phone : 034-513 359. A car parking lot is available close to the resort office near Chukadon boat pier. More information and photos of the resort can be found at www.ourweb.info/kir/.